A 6.4 magnitude earthquake struck off the Papua New Guinea on Wednesday, as The Epoch Times site reported, there's no tsunami alert was issued and no damage or injuries occurred in the said area. A magnitude 6.4 earthquake shook Papua New Guinea on Wednesday but no tsunami warning was reported. According to US Geological Survey that the magnitude-6.4 quake hit at a depth of 17 kilometers (10 miles) and the epicenter is about 30 kilometers (18 miles) north of Rabaul on Papua New Guinea’s island. 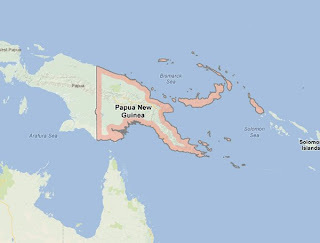 The Epoch also reported that a week ago, a 6.8 quake hit the coast of Papua New Guinea and no damage at all. While the Pacific Tsunami Warning Center also did not issue a tsunami alert. Even the Geophysical Observatory in the capital, Port Moresby, they had not get any damage or unusual wave activity report. Papua New Guinea lies on the “Ring of Fire,” that's why its common to have earthquakes in that country. For the meantime, If you like this information, please bookmark it now or visit this site more often for you to be updated. You may also share this post to your friends so they may know about Earthquake struck Papua New Guinea. Comments or suggestions about "6.4 Magnitude Earthquake struck off Papua New Guinea" is important to us, you may share it by using the comment box below.